Today we discuss a subspecies of Kroot, the voracious Kroot Hound and how to use them for the Greater Good. Notoriously bad-tempered, Kroot Hounds are utilized for the keen tracking instincts and ability to run a wounded enemy to ground. Like other Kroot subspecies like the Krootox, Kroot Hounds are more “tool” than “friend” to the more intelligent Kroot Carnivores. Their savage nature and ability to strike at vulnerable underbellies of their prey makes them a valuable component to any Kroot force. Re-roll failed charge rolls for this unit when targeting a unit that has suffered and unsaved wounds this turn. 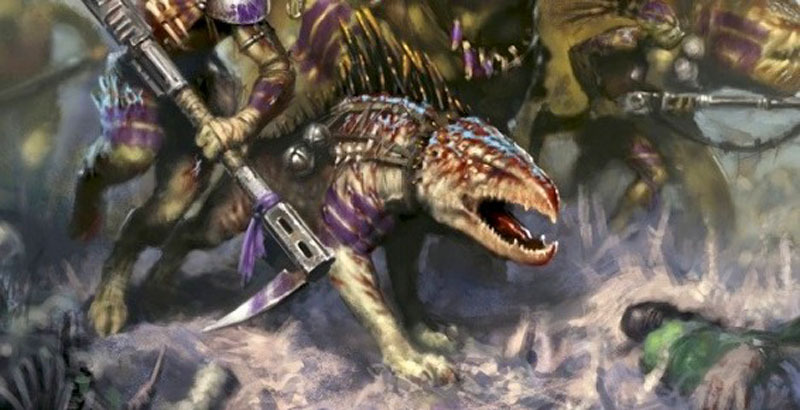 Of the four Kroot units currently with matched play rules (Carnivores, Krootox, Hound, and Shaper), I think the Hound may very well be the best. To start with, it’s the cheapest Kroot unit and cheapest overall T’au unit at just 4 points per model (ppm). While not as good as a guardsman, I think they can be niche-level decent. At their “rock bottom” price, they can be excellent fillers in Brigades if you just wanted to farm the CP’s. 3 MSU of Hounds would run you at 36 points and meet the requirements for Fast Attack slots within a Brigade. The next cheapest choice would be Pathfinders at 8ppm at 3MSU’s of those would run you 120 points, almost 4 times as much as the Hounds. Should you convince yourself that you don’t need Pathfinders (plenty of other ways to get markerlights), then you can save yourself the cost of half a 4xFusion Blaster Coldstar Commander by taking Hounds in a Brigade. It’s hard to go wrong with anything that’s so cheap, but what exactly do you get for those 4 points? Not nearly a Catachan, but something. 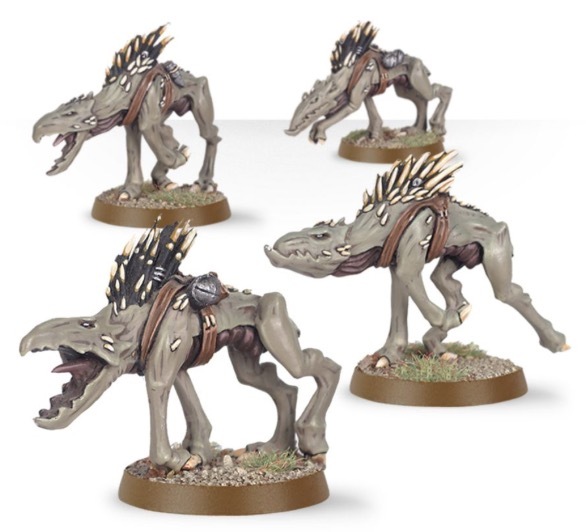 To start with, Kroot Hounds are fast with their 12″ movement. That means that you’ll be able to run 1st turn and then easily make a charge turn 2. Once they are in close combat, they are passable at best, thanks to their AP-1 and A2. Their S[User] (3) means that they will struggle to take down anything resembling a high Toughness target, but against the multiple T3 chaff units currently popular, they will represent a threat. Most of the time, Hounds should be taken in minimum strength units as Fast Attack slot fillers due to their abysmal leadership. To circumvent this, you could feasibly take an Ethereal on a hover drone (to help him keep up) and then they would be rolling Morale on its Leadership 9 (or 10 if it was Sa’cea). In larger units, they can cheaply bring bodies to the table and as long as you have a nearby Ethereal, can provide decent board presence. When in larger groups, they represent a more significant threat to vehicles without <Fly>. 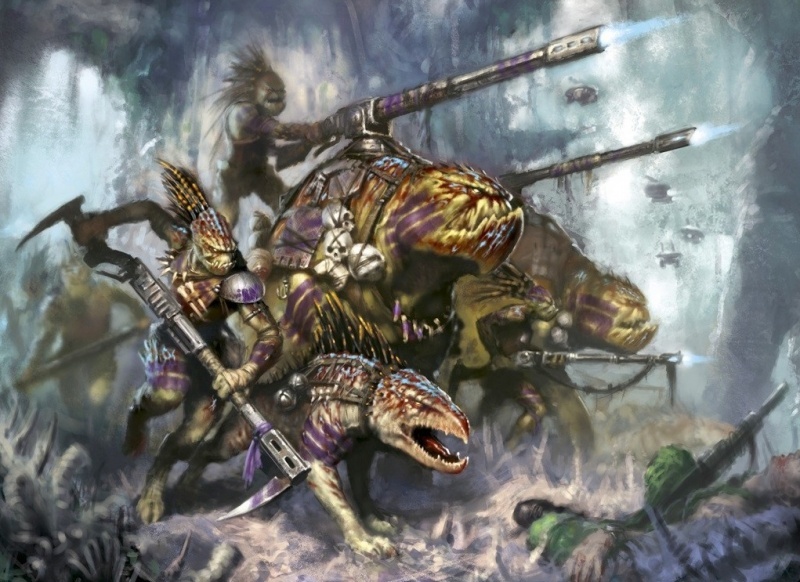 In my opinion, if a Kroot Hound lives to touch a tank and force it to fall back, then it’s paid for itself many times over. Larger groups are more likely to weather overwatch and survive for the following turn to force their target to fall back and thanks to the Voracious Predators special rule, you stand a better shot at making a longer charge to tie something up. Speaking of tying something up…Knights can fall back over <Swarm> and <Infantry> units. Kroot Hounds are neither, meaning that you could theoretically tie up a 600 point Castellan Knight with your 36 point Kroot Hound unit. Something to keep in mind. Like the other flavors of the Kroot rainbow, Kroot Hounds die to a stiff breeze. Any AP at all will just pass through as damage thanks to their Sv6+. Furthermore, they require support (like nearly all T’au units) to stand a chance at making their points back. You’ll have no trouble removing your opponent’s Hounds from the table, even if they bring the maximum 36 of them. However, that will mean you’re investing weight of fire at things that represent no real lethality threat to you. Keep this in mind when choosing target priority. On the other side of the coin, don’t get caught off guard by Kroot Hounds. If you’ve played against virtually any army that requires melee to stand a chance, you’ll know what to expect and how to mitigate against charges, pile-ins, and consolidations by proper unit placement and screening. In this case, don’t assume that just because you’re playing a T’au opponent that you won’t have to use those tools. Overall, Kroot Hounds are far from great or even really good. They are cheap though, and anything cheap deserve a look and can be situationally effective. Had it not been for the Rule of 3, 100 Hounds might have had some merit, just as a form of board control, unit tie up, and fringe-case shenanigans. Even still, 36 of them would require your opponent dedicate some firepower to them that would otherwise be aimed at your firewarriors, pathfinders, or drones. For the modest point investment, I’m not convinced they don’t have a legitimate role as a distraction unit. 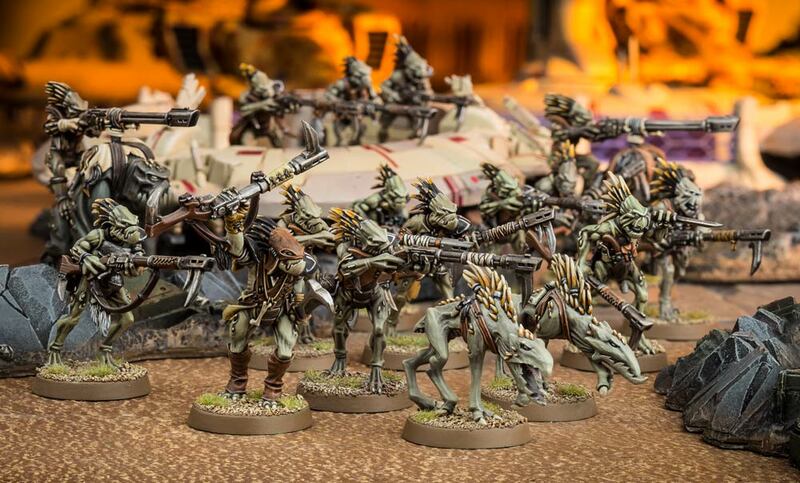 ~Do you think Kroot Hounds are worth your time?